According to some Internet surveys, online poker security is the most important concern for online poker players. 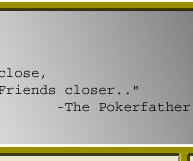 When The Poker Father visits the different online poker sites this is something that is definitely on his mind. However, once the players realize who they are dealing they know that if they cheat The Pokerfather they will be sleeping with fish very soon! Unfortunately not everyone has power like The Poker Father so he has come up with some online poker security issues that all players should consider when choosing an online poker site to play on. 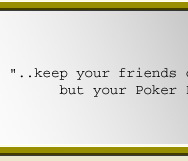 Firstly, choose an established and trusted poker site. This is the most important step in ensuring a safe and worry-free online poker experience. Potential players should consider site encryption, shuffling-integrity, anti-collusion measures, and deposit information when selecting a poker site. Players should approach all poker sites with a fair amount of skepticism. Once the basic security concerns have been relieved there are a few extra security precautions for online poker players. The first is government regulation. A number of sites are regulated by foreign governments such as Kahnawake (a native reservation in Canada), however, regulation is not entirely required. Regulation may provide some peace of mind when playing online poker, but other sites without regulation can be equally trustworthy. Certain jurisdictions that provide regulation offer little more than a professional looking logo in terms of actual security so do not rely solely on some form of government regulation to decide on a site. Another possible online security issue is the shuffling algorithm that the online poker sites use to deal the cards. Pretty much all sites can be trusted to have a reputable algorithm so long as they display signs of integrity. Furthermore, some online poker sites have their algorithm reviewed by 3rd party auditors. This ensures that the shuffling is as fair and random as possible, and therefore, creating the most real-life poker game possible. Poker Sites should also be forthcoming about their ability to override collusion. They should keep a backup of all played poker games and each player should be able to review his/her own hands at any time. This ensures that if there is a dispute over a specific game management can review it for errors and make corrections as needed. There is ample technology available to thwart colluders online so any online poker room should have it in place. Not only should the software have built-in detectors to ensure that players are not winning under questionable circumstances, but there should be a staff member manually checking out player complaints. Also, one should always play at a site that has enough dealers and support staff to ensure that any problems can be taken care of immediately. Even a highly reputable site is bound to have problems and there is nothing worse than having to wait around for help when you’d prefer to be playing online poker. Thirdly, statistics are kept on everything that happens at an online poker table and the site monitors things that seem out of the ordinary. For instance, players that play at the same table all the time or are involved in an unusually high number of the same hands together, will not get away with that for long. The only place where I think collusion could be somewhat of a possibility is in a limit game because you can't distort the odds. But because of suspicions other players have and the ability of the site to look into statistical aberrations it makes it very hard to collude. There are a number of online poker rooms that have been in business for over five years. Anyone of these long-standing online poker rooms should be safe, though if you have any doubts of its legitimacy you’re probably better off trying another room. There are so many online poker rooms that are reputable that there is no reason to play elsewhere. 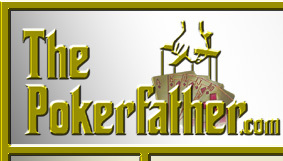 For example, any one of The Poker Father's Top Online Poker Sites are safe to play on. If you think a bonus or an offer seems too good to be true you should do a search on that site, and furthermore, if there is excessive negative feedback on the site you should avoid it. Please keep in mind that all sites will have some negative feedback so just make sure all the above mentioned Online Poker Security measures have bee met. The Pokerfather is happy to report that he has never experienced any poker security issues. Furthermore, most sites have advanced encryption algorithms that make it almost impossible to hack. Think about it, do you honestly think the online poker market would be booming like it is if there were recurring security issues? please feel free to contact The Pokerfather.